Dr Bernal specializes in MDI Implants. The MDI System consists of a miniature titanium implant that acts like the root of your tooth and a retaining fixture that is incorporated into the base of your denture. The head of the implant is shaped like a ball, and the retaining fixture acts like a socket that contains a rubber O-ring. The O-ring snaps over the ball when the denture is seated and holds the denture at a predetermined level of force. When seated, t he denture gently rests on the gum tissue. The implant fixtures allow for micro-mobility while withstanding natural lifting forces. How does MDI Technology Broaden My Options? Dental implant therapy has been one of the most significant advances in dentistry in the past 25 years. Tens of thousands of grateful patients bear witness to the benefits derived from the opportunity to obtain a replacement for lost teeth that restores their smiles and confidence. Several different types of implants and restorations are available. The choice depends upon the amount of bone available, the patient’s general health and restoration preference. The computer and medical worlds are both working hard to develop smaller and smaller components. In similar fashion, a smaller version of the dental implant has been successfully utilized in selected cases. These mini implants (1.8 cm diameter) enable us to broaden the spectrum of patients that can be treated. 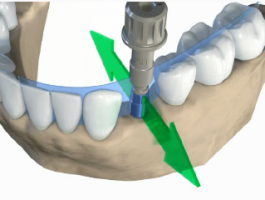 The Sendax MDI System was developed in order to provide greater denture stability for those patients who cannot withstand the rigors of conventional implant surgery, do not have enough b0one to allow for full-sized implants to be placed, or are in on-going therapy from one prosthetic system to another. Placement of the implants is accomplished quickly and easily in a process performed in our office, with local anesthesia or light sedation to help make you more comfortable. Using a precise, controlled, minimally invasive surgical technique, MDI implants are paced into the jawbone. The heads of the implants protrude from the gum tissue and provide a strong, solid foundation for securing your dentures. It is a one-step procedure that involves minimally invasive surgery, no sutures nor the typical months of healing.What Will My First Day Be Like? Leave the denture in place until bedtime. You should not experience any excessive bleeding. There will be some mild discomfort, but this should be minimal and controlled by the pain medication you have been given. If needed, take the pain medication only as directed. The denture should feel secure. You may eat as soon as you wish to, but avoid excessively hard or sticky foods for a period time, we will let you know how ling to avoid these foods. Upon removing the denture, rinse your mouth with an antiseptic mouthwash and clean around each implant fixture with a cotton swab and toothpaste. Use a cotton swab for three days. After that, use your toothbrush. The implants and O-ring fixtures must be cleaned and free from debris. Grasp the denture with both hands and lightly seat the denture feeling that the O-rings are resting above the ball head of the implants, then press down firmly and equally on both sides. Make sure that you feel the implant heads easily fitting each O-ring. You will feel the denture snap into place. If you have trouble seating your denture, first make sure that the implants and denture are absolutely clean. Secondly, make sure that you feel the implants resting over each socket. A light touch will give you the best results. Remember to push downward equally on both sides. If you are still experiencing difficulty, see if a spouse or family member can assist you in placing the denture. What About Care & Maintenance? You must brush and clean the ball of the implants as if they were your natural teeth. As with natural teeth, food and bacterial debris (plaque) must be removed, the plaque will cause inflammation of the gums and can be forced into the O-ring fixtures, causing improper seating and loss of retention. The O-ring fixture must also be cleaned. Need More Information? Contact us if you have any further questions. IMTEC has an excellent customer guide.